Wedding season is fast approaching, and like you, we’ve got our eyes peeled for flattering, stylish dresses to wear to them. Dress up or down any of the gorgeous dresses below and prepare to sip rosé under string lights at a boho barn wedding, chic city soiree or a backyard wedding. Pair this dress with a pair of simple black heels and statement earrings and you’ll be wedding ready. This versatile, on-trend dress can be worn for more than just weddings, though. It’s the perfect level of elegance for all your spring and summer events – graduations and holiday brunches, too! Throw on a pair of white sneakers and add a jean jacket for a springy office outfit. On-trend jumpsuit meets classic springy blue poplin? We’re in love. Pair this number with a string of pearls (or a pair of pearl earrings if that’s more your speed), a pair of cat-eye sunglasses and your most lady-like handbag. Get ready to toast to the happy couple! We love a delicate slip dress. Whether the wedding you’re attending is going to be in the sweltering heat of summer or just on the more casual side, this dress will keep you feeling (and looking) cool on the dance floor all night long. Pair with a fun slide or mule and a petite clutch for maximum style points. All the heart-eye emojis for this stunning red number. From Reformation’s newly extended plus size collection, this classic style will flatter all body type. Add some classic retro curls and espadrilles and you’ll have a wedding-ready retro look. 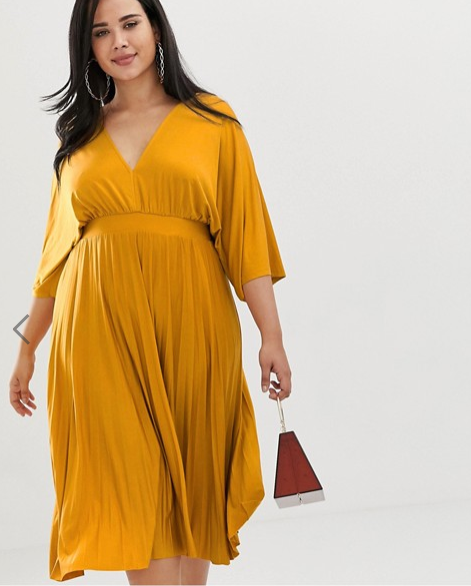 Mustard yellow meets kimono sleeves in this gorgeous dress that will turn heads. Embrace the most stylish trends of this summer by adding a pop of color in your handbag or shoes and pair with a statement earring. Hello, sunshine! No matter what your personal style is, find a dress you feel confident and beautiful in and you’ll be ready for spring and summer weddings, and every special event beyond.